Water Rat register Number: 627. Initiated into the Order on 13 June 1965. Proposer: Past King Rat Cyril Dowler. Seconder: Past King Rat Johnnie Riscoe. Elected to the Office of King Rat for 1987. I wanted to write this because Danny proposed me for the Order back in 1987. As one half of The Simmons Brothers I did four pantos with him (1984,85,86,87) and two major tours. Daniel Patrick Carroll came to England from Cork when he was nine years old in 1937. His first paid job (?1 a week) was at Coulson's Store, Exeter High Street. He was in the bakery section but didn't like the heat from the ovens! He then became a lift boy taking customers to different floors in the store. A lady he met during this time told him not to waste his life and got him a trainee's job as a window dresser at Huttons in Exeter. He also did a three year spell in the Royal Navy. Then went back to Huttons. He thought his life lay in the rag trade and in a way it did. He was transferred from Huttons in Exeter to their Oxford Street, London store and started arranging lunchtime fashion shows for them. Spells with amateur dramatic companies gave him the taste for performing and the rest "as they say" is history. He became one of this country's biggest stars. In the sixties his club in Hanover Square was the place to see and be seen. He appeared in countless hit West End Shows, pantomimes, summer seasons and tours. He appeared on three Royal Variety Performances, starred in the film 'Our Miss Fred' and even had a hit record "On Mother Kelly's Doorstep'. He was made an OBE in 2002 and was our King Rat in 1987. As King he did a great deal to promote the Rats even going on televisions Des O'Connor Show wearing his King Rats collar. He really was a one off; a true star; generous to a fault and always confident of his own ability. Our first panto with Danny was Mother Goose at the Theatre Royal, Plymouth. Producer Duncan Wheldon asked The Simmons Brothers to travel down to Plymouth for a press call in August where we would also meet Danny for the first time. We were doing Summer Season on the Isle of Wight and the only way we could do the trip was by plane. We got a guy to agree to fly us from Bembridge airport (a grass runway!) in a little Cessna and then fly us back in time for the evening show. At the Theatre Royal Danny introduced his driver and we said "This is our pilot" the only time we were ever able to upstage him!! I am proud that I was able to organise a tribute luncheon on behalf of the Water Rats for Danny on Friday 30th September 2005. It was a great day with excellent contributions from Barbara Windsor, Ronnie Corbett, Barry Cryer and Roy Hudd and of course, the man himself! If you get a chance have a read of "From Drags to Riches", his autobiography, first published by Viking in 1987. 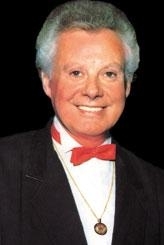 Danny La Rue was one of the great characters in our business. He will be sadly missed and will always be remembered by an adoring public who flocked to his shows when he was at the height of his popularity.